For years, copies of these tapes have been passed from apprentice to apprentice like sacred relics. The Alan Chadwick Society, which was formed soon after Alan's death in 1980, sold copies of the Villa Montalvo (Saratoga) and Santa Cruz lectures at least as early as 1984. The University of California at Santa Cruz has a large collection of tapes available for listening in both the Special Collections Department and the Media Center. Some of these lectures are available for sale over the internet in CD format, or as written transcriptions. We here at Alan-Chadwick.org are working to make more of them available for listening on this website. The photograph on the right was first published in the Alan Chadwick Society Newsletter (Volume II, Number I, Spring and Autumn 1984). Used by permission courtesy of Paul Lee. 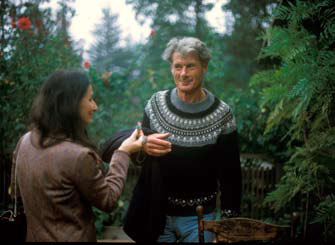 A candid and personal portrait of Alan Chadwick where he discusses many of his philosophical approaches to gardening and to life. This was filmed in 1978 just before he left the Covelo project. Chadwick's presentation here is especially interesting because the photographic images of him speaking add depth to what he expresses in words in the other lectures. The film quality is marginal in places, and the sound is generally fair, nevertheless, the real Alan Chadwick comes through loud and clear. The sound quality of these Villa Montalvo lectures is excellent. Some Chadwick apprentices consider these the best talks that Alan delivered anywhere. They are very direct and they include most of the themes that he touched on in the talks that he gave throughout the period of his work in the United States between 1967 and 1980. Alan was living at Green Gulch at the time he gave this series; Greg Haynes drove him down to Saratoga for the presentations. An extensive series of lectures given to a select group of apprentices at the Virginia garden project during the period that Alan was rapidly approaching the end of his life. These lectures can be considered a resume of the teachings that he developed over the entire period of his work in horticulture. Alan is in a remarkably up-beat mood, as evidenced by the tone of his voice and the laughter of his students. The sound quality of these recordings varies considerably, though most are generally good. 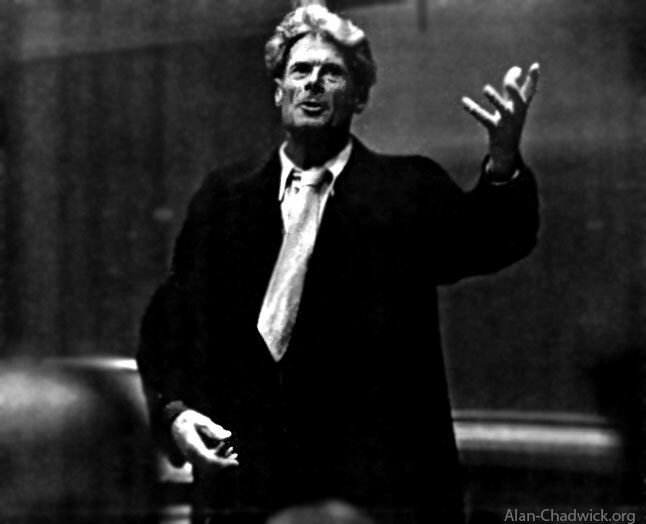 Why don't we present more of Alan Chadwick's lectures?